*Limited time, some exceptions apply, inquire for details. Our luxurious one, two, and three bedroom Lake Nona apartments for rent raise the standard of Southeast Orlando apartment home living. Our apartments near Sea World offer everything you could as for, including a convenient location. You’ll love our spacious floor plans that feature granite countertops, washer and dryer, and ceiling fans. Nine-foot ceilings, wood inspired plank flooring, screened in lanai or balcony, and showers in master bedroom suites all make Dwell a great place to call home. Dwell Nona Place’s pet-friendly apartments in Lake Nona feature a dog park with an obstacle course and dog washing station, providing the perfect place for your best friend to get some fresh air and exercise, and maybe even make some new friends! Everywhere you want to be is within easy reach of your Lake Nona luxury townhome neighborhood. Our Southeast Orlando apartments near Medical City are located close by route 417, acreating an easy commute for all. Our apartments are convenient to some of the top schools in Lake Nona as well as, great local universities like UCF College of Medicine Lake Nona. 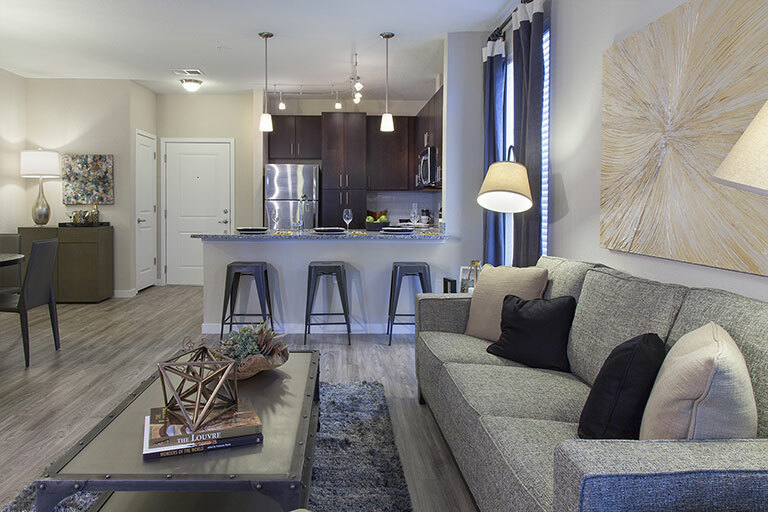 Dwell Nona Place is steps away from Whippoorwill Center featuring exciting and delicious dining options, including: Smashburger, Moe’s Southwest Grill, Bolay, and Marco’s Pizza! Dwell Nona Place is owned and managed by The Klein Company, whose reputation for excellence in apartment management has been earned by combining skilled management teams with a company-wide emphasis on customer service. As a Klein Community, Dwell Nona Place assures its residents the highest standards of quality and service and responsive, caring property management. Looking for Lake Nona apartments for rent? Call Dwell Nona Place today! Our Lake Nona apartments are equipped with luxurious amenities, and come in one, two, and three bedroom styles. 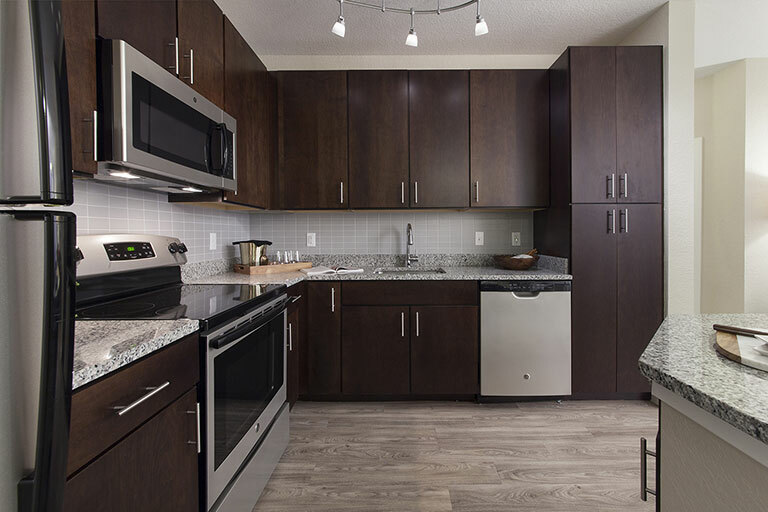 Our gourmet kitchens are designed with convenience and style in mind, featuring granite countertops, chef-inspired islands, under-mount stainless-steel sinks, stainless-steel Energy Star® GE appliances, and USB charging stations. You’ll love our full-sized washer and dryer and large walk-in closets that provide just the right amount of space for all your belongings. Need more space? We have outside storage closets, too. You’ll feel as if you’re living in paradise when you enjoy Dwell Nona Place’s zero-entry resort-style pool and cabana lounge area. Palm trees line the pool beach area, and we provide hammocks for relaxing on lazy days. As a pet-friendly community, cats and dogs are welcome! We have a fenced-in on-site dog park and dog-washing station with fur dryer. Give us a call today to tour our Lake Nona apartments! 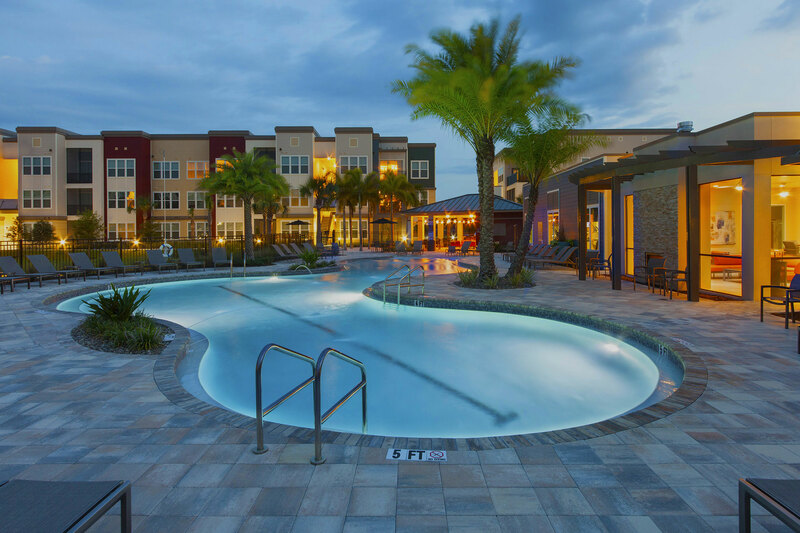 Live the high life at our luxury Lake Nona apartments! Our resort-like pool with cabanas and grilling stations are the perfect retreat after a long day. No time to get your car washed? Check out our car care zone. Bring your four-legged friends along and enjoy the fenced in dog park on-site, complete with a dog wash station and fur dryer. All of our apartments in Lake Nona feature large walk-in closets, showers in the master bedroom suites, extra storage, and a full size washer and dryer in each home.